Two games. Lots of positives. Lots of signs of improvement. Lots of frustration. No wins. Mention the positives to Head Coach Lance Leipold or the Bulls players, and you get a dirty look. Yes, they’re happy with the improvement. But coaches and players are focused on only one thing: wins. Right now, the Bulls don’t have any. That’s why their mood is a little salty. That’s why Saturday’s game is so important. It’s time for the all the good plays, improvements and development to result in wins. I would be saying that if it’s Colgate, Florida Atlantic, Kent State or Western Michigan on the schedule. The fact that it’s an FCS team means it’s either easier to do that, or there’s more pressure to do that. There will be no letdown from the Bulls, even though they’re facing an FCS team. Albany last year taught them that lesson. Being home will help. Being ready to get rid of the frustration from the first two games will help the most. 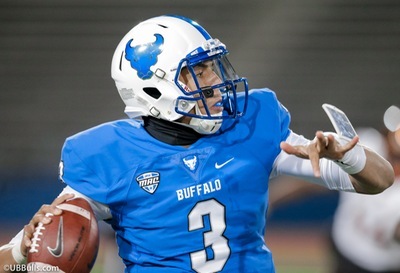 Bull Session Trivia: Tyree Jackson’s 75-yard touchdown run against Army was the longest run by a UB quarterback since the team moved up to Division I. What Bulls QB’s 68 yard run against an SEC team six years ago is now second on the list? Jackson’s long run is now one of four plays of 48 yards or longer in the first two games. Last season, the Bulls had only three of those plays. That’s an indication of Jackson’s maturity and development, and the increased skill level at the receiver position. Antonio Nunn’s speed put him in the clear on the 48-yard touchdown. Anthony Johnson was actually covered, but still went up and grabbed Jackson’s throw for the 52 yarder in the first quarter against Army…Jackson admitted he was running out of gas on his 75 yard run. He knew he’d take a lot of grief from his teammates if he was caught, and that was the motivation he needed. I asked him if he’s ever run that far in his football career. Tyree’s response: “Not at 240 pounds.”…A key play in the game against Army came with the Bulls up 17-7 in the second quarter, and starting a drive at the Army 32. It was a chance to go up three scores and possibly clinch the game. That’s what they were trying to do. It was a flea-flicker play that was called. Emmanuel Reed was hit when he turned to pitch the ball to Jackson. That caused the fumble that Army recovered, and it was a huge momentum swing…The Bulls had only nine offensive possessions, as Army milked the clock. That held down on all the offensive stats, and was a big reason why Jackson only threw 16 passes…It also effected the ability to get the running game going. That could be a focus against Colgate. Including the long Jackson run, the Bulls are averaging only 85 yards and 3.3 yards per carry…Anthony Johnson is currently the MAC’s 2nd leading receiver, and he’s third in receiving yards…Colgate’s best defensive player is not likely to play. Defensive end Pat Afriyie is an FCS All-American, and he was last year’s Patriot League Defensive Player of the Year. He suffered a leg injury in their opener, and did not play last week. Afriyie is a legitimate NFL prospect…The Raiders play a 3-4, much like Army. They are good against the run, holding their first two opponents to 2.9 yards per carry…Linebacker T.J. Holl has 25 tackles, which ranks #2 in the FCS…The safeties are very good. Alec Wisniewski is a hard hitter, Ben Hunt is very athletic…Colgate’s defensive coordinator is Paul Shaffner, who was the Buffalo State Bengals head coach from 2004-2008. He’s a native of Lancaster. Defensive tackles don’t usually get much attention. If they’re doing their jobs, the linebackers and defensive ends get all the glory. But Chris Ford and Justin Brandon deserve some attention. They are playing very well, and DT may be the most improved unit on the Bulls defense. Brandon has shined in his first year as a starter. His 13 tackles are 5th on the team. Ford has 8 tackles. Both were standouts in their toughest game, stopping the fullback dive against Army…Khalil Hodge is benefiting from their play. He’ll be the first to say that his NCAA-leading 31 tackles are because Ford & Brandon are tying up blockers and letting Hodge get to the ball….Starting defensive ends Damone Harris and Chuck Harris has their best career games against Army, with both setting new career highs in tackles….The Bulls moved Ishmael Hargrove to the other outside linebacker spot last week, and he responded by combing with Jarrett Franklin for 19 tackles….Regular cornerback Cam Lewis was moved to safety to get him more involved in the run game. He had six tackles…Colgate will likely start a true freshman quarterback on Saturday. Grant Breneman had been splitting time with sophomore Carmine Scarfone. Breneman came in for the third series last week against Richmond, played well, and stayed in for the whole game. He ran for 67 yards, but was only 10/21 throwing…Scarfone started the opener, and will still likely see some playing time against UB…The Raiders will use three running backs. James Holland is the starter. He was hurt for most of 2016, after gaining over 700 yards in 2015…Alex Matthews is next, and he had a 57-yard TD run in the opener against Cal Poly…Malik Twyman is a speedy freshman back…Colgate currently leads the Patriot League in rushing, at 178 yards per game and 4.9 yards per carry…Four seniors start on the Raiders offensive line…One of their receivers has the best name I’ve heard for a speedy wideout: Owen Rockett. Friday, the Athletic Department announced the long-awaited Fieldhouse details. Construction will begin in the next few weeks, and the facility will be located behind the scoreboard and the north end zone. The 92,000 square foot facility was funded totally by donations, and will benefit all of UB’s student athletes. But it’s a game-changer for football. In the recruiting world, facilities drive success. Now, UB Football will have what nearly all the MAC teams have. That will help convince recruits that Buffalo is the place for them. That will lead to better players, and more wins. It’s a been a long wait for this facility, but by early 2019, the wait will be over. Bull Session Trivia Answer: Chazz Anderson ran 68 yards for a touchdown against Tennessee at Neyland Stadium in 2011. That was the longest run by a Bulls QB in FBS history. Overall, the previous record was Cliff Scott’s 70 yard scamper against Duquesne in 1991. Please join me, color analyst Scott Wilson, game host Brad Riter and postgame host Bob Gaughan for the broadcast on the Bulls Football Network. Our special two hour pregame show starts at 4:00pm. You can hear it in Buffalo on ESPN 1520 and in Rochester on Fox Sports 1280. A link to the online broadcast is also available here and on the Tune In app.